Today’s guest blog is from Rick Wilk, a leading scholar of food, consumption, agriculture, and various other topics. His recent books on food include Home Cooking in the Global Village and Rice and Beans. Rick is Provost Professor of Anthropology at Indiana University, where he heads the PhD in Food Studies. Why is it so hard to get North Americans to change their diets? I am tempted to start this post with the old Monty Python line, “and now for something completely different…” but actually there is a clear connection between my point and issues that Glenn has previously opened up in this blog. Despite all the bad news about contamination of the food supply, melting ice in Greenland, epic drought, and the dangers of a fatty, salty diet, people in the USA seem to keep munching through mountains of burgers and fries. Generations of nutrition education has done no more than make people feel a twinge of guilt on the way back from the grocery store with bags full of frozen pizzas, 64 oz sodas, and huge sacks of chips. Recent figures from the Center for Science in the Public Interest on food consumption in the USA show no dramatic change, despite the fashions for local, organic, and home cooking. The more honest scholars in the field of nutrition and diet have had to admit that educating people about nutrition to change their diets for the better has not worked very well (‘miserable failure’ would be an alternative term). Julie Guthman even suggests that a lot of diet advice and the implicit shaming of fat people as ‘weak’ is counterproductive. There is no evidence that treating the overweight and obese as disgusting deviants motivates them to lose weight. Guthman also points to the not-so-subtle way that class and race are connected to weight and diet in the moral politics of the food movement in the USA. The educated upper middle class has always frowned on the way poor people enjoy themselves. Victorian-era North Americans and Europeans were offended by the rough games, loud language, public drunkenness, lewd behavior and rowdy partying of the working class, particularly at festivals, fairs, and carnivals. Basically they were having way too much fun, and they had to be stopped. Eating was part of all these public and private entertainments – some archaeologists claim that feasting was the first form of human conviviality, even the first human social event. Eating went along with happiness, drinking, letting down formalities, enjoying company, and all those things almost any human can recognize as a good time. It should not surprise us that after the privations of the depression and WWII, people in the USA were ready for a change in the way they ate. Don’t miss James Lileks’ Gallery of Regrettable Food. The war helped centralize the food industry, which sought out new advertising firms to help them find new ways to sell manufactured and processed foods. To put it simply they rediscovered that food could be a lot of fun. Mom could make all kinds of funny dishes to entertain the kids! 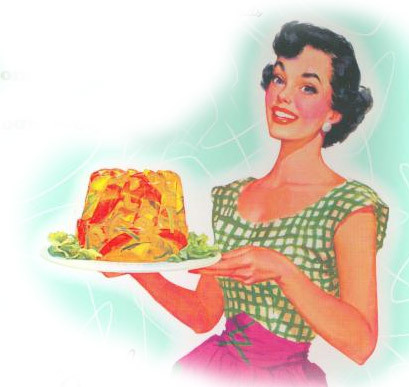 She could use mixes and canned food (and don’t forget the jello) in infinite combinations for neat themed parties! Give weary dad something to look forward to when he comes home from work to flop down in the Lay-Z-Boy! The idea of fun food proved an endless gold mine for food corporations and the burgeoning fields of food and flavor science. As the sixties rolled along, sports figures and cartoon characters were recruited to sell new products, and food began to resemble other consumer goods. Instead of being produced by farmers and picked by sweating migrants, it was now brought to you by happy Italian chefs and Green Giants from mythical valleys. New tastes were constantly introduced, brand loyalty was cultivated, fashions and fads were fed by publicists and celebrity connections in mass media. Kids were especially pliable, and by the 1970s the boundary between toys and food had almost disappeared; the packages looked the same. 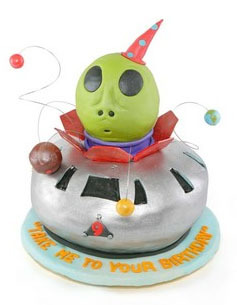 Artisinal nutritainment: Alien “Take Me To Your Birthday” cake by Chicago cake artist Stephanie Samuels of Angel Food Bakery. You could buy toys in food stores, food in toy stores (and drug stores, gas stations, office supply, hardware stores…), and sometimes the food comes with a toy inside or attached. But who cares, because most of the time we are playing with our food as if it were a toy anyway. Food is no longer about nutrition, it is part of a cultural complex devoted to nutritainment. I find it almost as discouraging to find that most scholars who study food have completely mirrored upper middle class attitudes. We study nutrition, fair trade, environmental justice and a host of other serious and important issues – but where is the literature on food and fun? Yes, anthropologists and sociologists talk all the time about commensality and the convivial pleasures of the dining table. But how about some ethnography of kids’ food fights? Or tailgate parties? On Super Bowl Sunday in 2012, Americans munched their way through 143 million avocados, 111 million gallons of beer and 100 million lbs. of chicken wings. Now there is a topic for a few dissertations. I love this! My graduate training is in anthropology and public health, and I’ve long thought that public health people have ignored the role of pleasure in health behaviors. I currently pay the rent in a low wage blue collar job, and most of my colleagues smoke (a far cry from my days in academia). They don’t smoke out of weakness of character, or because they are dupes of the tobacco industry, they smoke because it is pleasurable, and lord knows the job isn’t. And since smoking has been pushed outdoors and into designated smoking areas, it has become a highly pleasurable social activity. My feeling is that it is a form of commensality. Sharing a cigarette is like sharing a snack, with the added benefit that you get to do it out of the surveillance and control of the boss, at least for a few moments. Excellent article and great points. Time to start hating on people about food and enjoying the food. I am also glad that this talks about the societal bigotry that often goes with our feelings about our bodies and food. Well done! Very interesting article! One thing I wonder: the article states that “nutritainment” emerged as a reaction to (European) Victorian dryness in regards to food. But the enjoyment of food in Europe is very different from that in the US (and even different across places within Europe). So why did these places react differently to the Victorian approach to food?